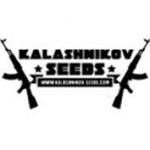 Kalashnikov Seeds - Baikal Express. Free US delivery. Baikal Express is one of the best existing express strains in the whole world right now. Cross breeding Kashnikov Seeds favorite Kubanskiy Ubiyza with Sativa strains from Far East Baikal Lake region, they got a strain that is very powerful, very resistant to the elements, and is fast growing as greased lightning! Whilst it maintains the psychoactive qualities of Sativa, it blooms a lot faster. It's heavy Kubanskiy Ubiyza effect is balanced with a Sativa one, making meditation and thought processes both deep and stimulated. It has a lemon taste, very Haze-like, though sweetish in the end, creating a sort of flavour gradient.